After a fabulous start to my MeetUps for 2019 designed to help you to set your self up and optimise innovations to maximise your potential…. here is the next event! How is Your 2019 going to be ? 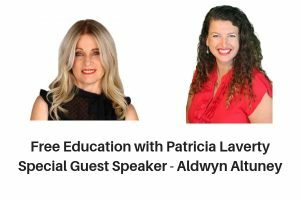 Our next event has a Special Guest Speaker – Aldwyn Altuney who will be speaking on “How To Get $1 Million Worth Of Free Publicity. Aldwyn Altuney is an outgoing Photojournalist who has worked in traditional media (newspapers, magazines, TV and radio) around Australia for about 20 years. She was first interviewed by the media at age 10 as a top Australian junior table tennis player and went on to work in the media, interviewing stars including Hugh Jackman, Russell Crowe, Cyndi Lauper, Debbie Harry (Blondie), Alby Mangels, Jimmy Barnes, Jimeoin and Mikey Robins, among others. She is passionate about bringing out the best in people and making a difference in the world one step at a time. And remember my motto: Don’t Stop Until The Miracle Happens ! 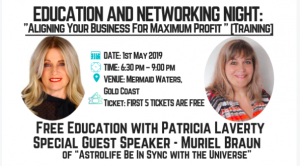 Hi, do you still have tickets available for the event on the Gold Coast tomorrow night? Hi Yvette, Sorry I just got your message.